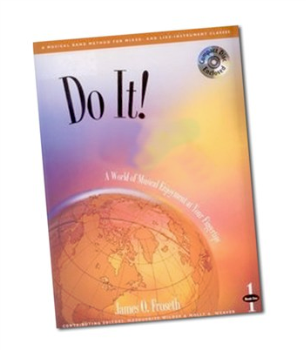 This major band method by James O. Froseth has it all: Artist performers set musical standards in sound with more than 80 great performances on CD for every instrument, and one CD lasts for the entire book! The repertoire and recorded contexts are motivating, informative, and entirely musical. Every song includes text, providing information about phrasing, rhythm, style, affect, emotion, history, and culture. A unique Rhythmic Pattern Dictionary allows students to “look it up” and “listen up.” An individualized format allows students to progress at different rates with a “theme and-variation” format. Ear training and improvisation are integral parts of the lesson format.